One of my annual summer hilights is seeing Pilobolus at the American Dance Festival. 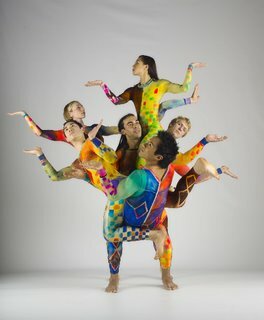 Of all the modern dance troupes I've seen over the years at ADF and other venues including Jacob's Pillow and college campuses, I am struck by the sheer joy and unbelievable contortions that Pilobolus dancers exhibit, all the while seemingly effortlessly using their strength to amaze audiences with what the human body is capable of. Their dances often are humorous and always full of the most uncommon creativity. Tonight was another excellent performance. I went with a friend and my wife. Pilobolus opened with Prism, a new piece they created this year, and probably my second favorite of the evening. They ended with the dance I relished the most, Day Two (1980), which included their typically impossible acrobatics. They also did a short humorous Solo from the Empty Suitor (1980) which had one of their dancers negotiating rollers on the floor, and Gnomen (1997) and Shizen (1978). What fabulous dancers with such talent and finesse! There was a Q&A afterwards; the dancers were good spokespeople for modern dance and their decades-old troupe, and I particularly enjoyed hearing about their rigorous full-time passion. Their schedule has them touring for, as I recall, 8 or 9 months each year, with the rest of the time, except for only two weeks off, focused on creating two new dances. Pilobolus (crystallinus) is a phototropic zygomycete - a sun-loving fungus that grows in barnyards and pastures. It grows on a stalk as a small bladder, pressurized by cell sap and topped with a tiny black cap filled with spores. When time and Pilobolus are ripe, this entire sporangium is blasted off with incredible force and the little spore bags can shoot over a cow like clowns out of a cannon. It's reported that the acceleration - from 0-45 mph in the first mm of flight - is the second fastest in nature. Pilobolus, the arts organism, germinated in the fertile soil of a Dartmouth College dance class in 1971. What emerged was a collaborative choreographic process and a unique weight-sharing approach to partnering that gave the young company a non-traditional but powerful new set of skills with which to make dances. The group was immediately acclaimed for its startling mix of humor and invention and Pilobolus soon became a self-sufficient organization, its members choreographing, dancing, managing, and publicizing their own programs. Images 'trevi fountain' and 'scorpion close-up_1' sent by Pilobolus and used with their permission for use on this blog. Photos by John Kane, courtesy of the Joyce Theater.